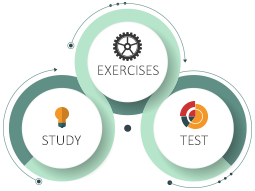 We generate a personal study plan for you based on the information you give us: your preferred study mode, your current level of English, your target level, and the number of months you are giving yourself to reach your goal. It is a flexible plan and can be adjusted at any stage if your time frame or your goal changes. Your study plan is extremely detailed. It tells you exactly what to study each week and approximately how long you should spend on each lesson. 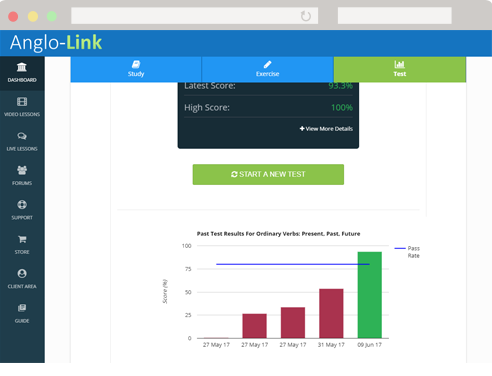 When you have completed a lesson and passed the test for it, your test results appear in your study plan so you can easily track your own progress. Our online English course is divided into three levels: elementary, intermediate, and advanced. 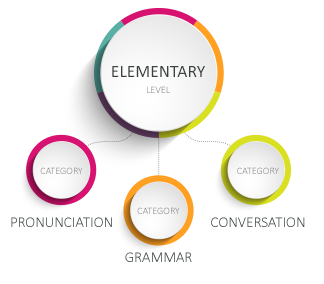 Each level is divided into three categories: pronunciation, grammar, and conversation (vocabulary). This creates a highly organised framework for your English studies. Each category contains a number of lessons going from easy to more difficult. Each lesson includes a study section with detailed and clear explanations, an exercise section to deepen your understanding, and a test section to check your assimilation. Every lesson has its own test with a minimum pass rate. The scores you receive indicate how strong you are in that particular topic. Our goal is to help you achieve 100% on every test by giving you detailed feedback on your test results. The feedback system highlights your mistake(s) and directs you to the section(s) of the lesson that you specifically need to revise. After your revision, you should retake the test to make sure that the challenging point is now clear. You can then move on to the next lesson. When you have successfully completed all the lessons in your study plan, you have the option of submitting final online tests for an evaluation of your level of English and feedback on what you still need to improve. If you pass all four sections of the 'Fluent' level test, you are awarded Anglo-Link's 'Fluent' certificate. Our 'Fluent' rank is the equivalent of the C1 level of the CEFR, 7 on the IELTS test, and the 94-101 bracket on the TOEFL test.